Adorable! Disney has revealed another lovely teaser trailer for Pixar's Coco, the first musical from Pixar, arriving in theaters later this year (see the first teaser here). This teaser trailer is a bit unique - it's actually a fun short film titled Dante's Lunch, focusing entirely on the dog from the movie. This reminds me of the Scrat short teaser videos that Blue Sky uses to tease their Ice Age movies. Dante is a breed of dog called the Xoloitzcuintle, or "Xolo", better known as the Mexican hairless dog, and he befriends the boy named Miguel in the movie following him to the land of the dead. I love that we're getting another Pixar movie that has a dog as one of the main characters, so I'm totally into this already, even if this isn't my favorite teaser. Enjoy. 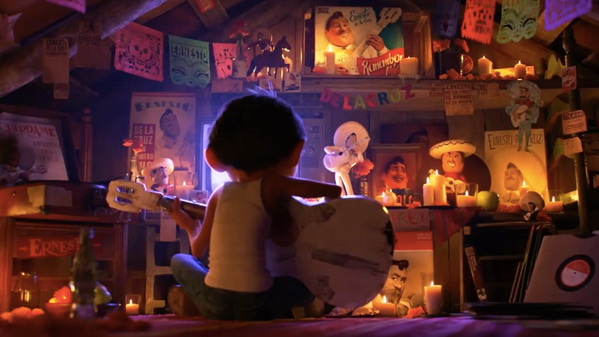 You can also still watch the first teaser trailer for Pixar's Coco here, to learn more about the rest of the story.